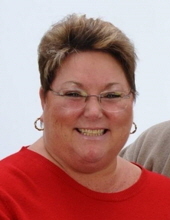 It is with great sadness that the family of Paula Rae Slagle announces her passing after a short, but hard-fought battle with cancer on Thursday, January 31, 2019, at the age of 54 years. Paula, a life-long resident of Des Moines, Iowa, grew up on the east side where she graduated from East High School in 1982 before moving to the south side of town to start her family. She spent most of her career working in customer service at CDS Global before moving to Des Moines Water Works; both were places where she used her kind and caring personality to help others. Paula will be lovingly remembered by her husband of 29 years, Ted, and her children, Alex (Jenna) and Adam (Beth). Paula will also be fondly remembered by her mother Helen, stepfather Jim, siblings Steve (Weslee), Carleen, and Scott (Kim); brother-in-law Ron, and sisters-in-law Sandy and Teresa (Dave); and her nieces and nephews. Paula was predeceased by her father Herb, sister Tori, brother-in-law Scott, brother-in-law Fred, father-in-law Gilbert, and mother-in-law Phillis. A Celebration of Paula will be held on Saturday, February 16th, 2019 from 1-3pm, at Caldwell Parrish, 8201 Hickman Rd, Urbandale, IA 50322. To send flowers or a remembrance gift to the family of Paula Slagle, please visit our Tribute Store. "Email Address" would like to share the life celebration of Paula Slagle. Click on the "link" to go to share a favorite memory or leave a condolence message for the family.